A group of international scientists have been observing as the largest known star in the Universe tears itself apart. Astronomers from the UK, Chile, Germany and the US have watched as W26 in the Westerlund 1 star cluster shed its outer layers and flings a huge cloud of glowing hydrogen gas out to return enriched material back to the interstellar medium. The latest observation, reported in the journal Monthly Notices of the Royal Astronomical Society, is considered to be a vital step in understanding how massive stars help enrich the space between stars, which is necessary for forming planetary systems. 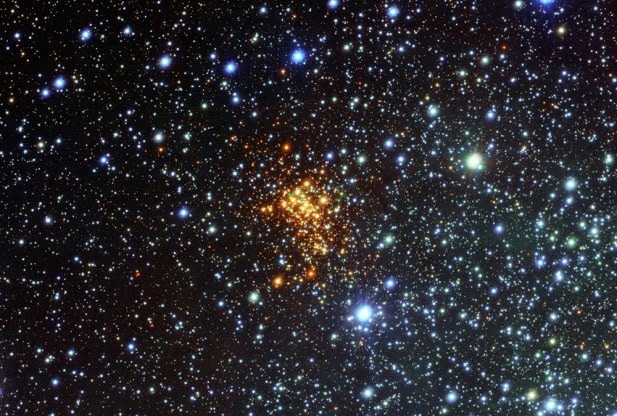 Westerlund 1 is the most massive cluster of stars in the Milky Way galaxy. The cluster, which is 16,000 light years away from Earth, is home to several hundred thousand stars. Astronomers used the Very Large Telescope (VST) at the European Southern Observatory’s Paranal Observatory in Chile to observe Westerlund 1 when they happened to discover W26. They realized that the star was probably the largest ever discovered, with a radius 1,500 times larger than our Sun. They also discovered that W26 is one of the most luminous red supergiants ever seen. Glowing hydrogen-gas clouds like the one seen around W26 are rarely found around massive stars, and are even rarer around red supergiants. This was the first ionized nebula ever discovered around such a star. While W26 is too cool to make the gas glow, the astronomers believe the source of the ionizing radiation could be either hot blue stars or possibly a companion star. The nebula around W26 is similar to the nebula surrounding SN1987A, which is the remnant of a star that exploded as a supernova in 1987. SN1987A was the closest observed supernova to Earth since 1604, and it gave astronomers a chance to better understand the properties of these explosions. Astronomers will be able to use the new nebula around W26 to better understand the mass loss processes around massive stars. Stars with masses tens of times larger than the Sun live very short and dramatic lives, with some having lifetimes of less than a few million years before they exhaust all of their nuclear fuel and explode as a supernova. When a massive star reaches the end of its life it becomes highly unstable, ejecting a considerable amount of material from its outer envelopes. This material has been enriched by nuclear reactions deep within the star and includes many of the elements necessary for forming rocky planets like Earth. Knowing more about how this material is ejected and how it affects the evolution of the star would enable scientists to better understand the evolution of our universe.